Don’t you smell marketing or the making of the next oligarch somewhere in those words? For most of you the Lokpal Bill aka Anna is only anti-corruption. A few even call it the next greatest revolution in Indian history after her Independence, but how many of you’ll actually know what the bill reads to the smallest clause? I’m sure less than 5% percent of the supporters really know the whole deal of what they currently approve off, and only a smaller percent of this miniscule know the repercussions of such a dangerous protest which questions the basic principles on which this nation is built on? Do you feel that making another governing body stronger than the current one would solve problems? Temporarily, it still might. But think about the longer run. If an ombudsman is going to have more power than the Prime Minister of India isn’t that dangerous and dictatorial to say the least? 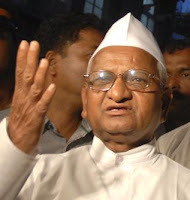 What makes you think that there won’t be a fight for power in the New Governing Body after Anna Hazare? With due respect to all the stakeholders, it’s easy to say that Team Anna is all people who’ve done a lot to the society, but none of them have every been/seen a position of so much Power in their life; and the human brain for all we know has its own way of amazing us every time. A few of you might argue that this is for the betterment of India and this agitation must go on etc. Well I surely don’t disagree that the thought & the motive has nobility written all over it and is surely something to be appreciated, but the undemocratic blackmailing methodology adopted to achieve the same is far from noble. Think about it, if the government is to heed to this demand and pass a bill in such a short period of time then before we realize we’re going to have half of India going on hunger strikes and blackmailing the government for their own various causes. This in turn would put India on a more dangerous disturbed civil agitation! India has been long admired as the largest democracy, which has primarily been because we follow the constitution that was set 61 years ago. But now with this kind of blackmail aren’t we going against the basic tenets of our very own constitution? Now the obvious next question is can we leave corruption to stay this way? The answer is a big NO! Then instead of going on a hunger strike, a more rational and righteous way of putting forward your bill in the parliament should ideally be the first step forward. Then we need to look at a policy which decentralizes power and not empowers another single individual/body. Most importantly we need to make changes where it currently seems impossible. In other words, corruption at the lowest level from giving a bribe to a cop for riding/driving without a license to paying an RTO officer to avoid a couple of extra visits to the RTO. Only if we change in this small way will it affect the whole issue of corruption at large. Moreover we cannot point fingers at someone for corruption when we ourselves are indulging in it. You may argue that the scale is not comparable, but a wrong deed however small doesn’t have variable change associated with it. I’d like to sign off hoping that all of us look to actually look at a revolution and not just a mere short term eye wash! Jai Hind! Don't u think that no one ever wants to be a part of the corruption, they do it by virtue of their nature. Our people with due respects were brought up like that..they were always like that..they need some spring to come into action..they would always be submissive and complying but when a revolt starts they would be up and running for it without even knowing the cause. I guess the need of the hour is to understand how we can change in order to bring a change..if we don't change i guess then even 1000 anna's would also not save us from immoral policies which are prevalent. @SunnyBoy: Well I completely agree with you when you say that indians sometimes are submissive and complying and blindly follow a cause. But I think the current generation and India as such is way too well connected to the outside world and we've had a lot more exposure (as much as anyone else would in any part of the globe) to blame our upbringing for our current actions. We cannot just pass the blame. Again change is something that's always happening, what we need is something more progressive and more logical. Corruption needs to tackled at a grass root level and hence in a more bottom-top fashion than just making a dictatorial one like Anna Hazare.